Is your marketing led by what your clients will value or what your firm thinks they want? Do you understand what each client segment's goals, challenges, interests and needs are? Do you know where they spend time online, how they prefer to be communicated with and what a day-in-their-life looks like? If you don't know the answers to these questions then how can you create content that talks to them, that they will search out and value? If you want to create an effective strategy to attract and delight more of your ideal clients then you need to understand them inside and out and integrate that research into everything you do. Which is where buyer personas come in. They not only help you to better understand your ideal clients' motivations but also the process they go through from identifying a problem or opportunity to engaging your services. And they incorporate key themes and findings gleaned from your client interviews, end of project and tender win/loss reviews, enabling you to get really smart about the way you communicate with them. 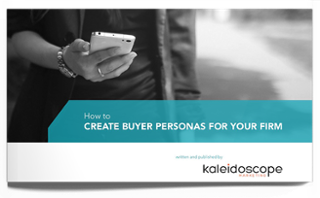 I want to download the free buyer persona guide! What's your biggest marketing or business development challenge? Copyright © 2017 Kaleidoscope Ltd. All rights reserved.